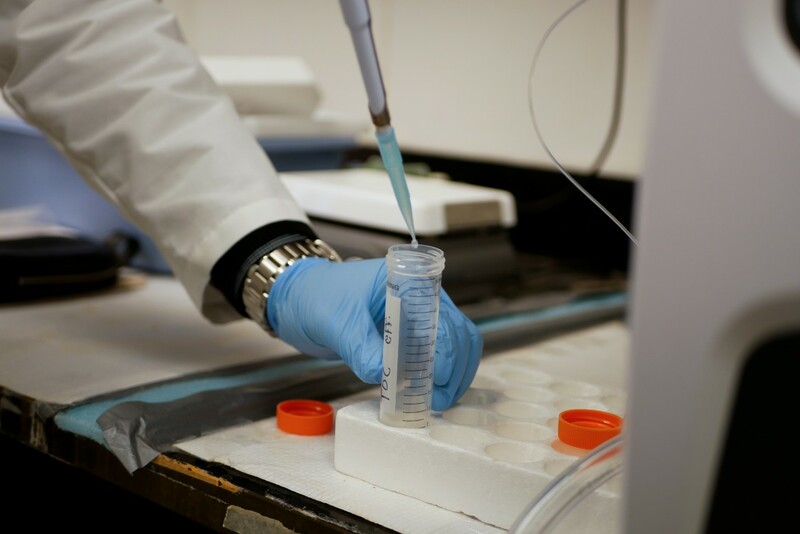 A researcher at the University of Cincinnati is studying ways to dispose of volatile organic compounds (VOCs), a lead contributor of smog. Unchecked, smog can stay trapped in the atmosphere, hovering near the ground and causing sickness and affecting the long-term health of anyone who breathes it. 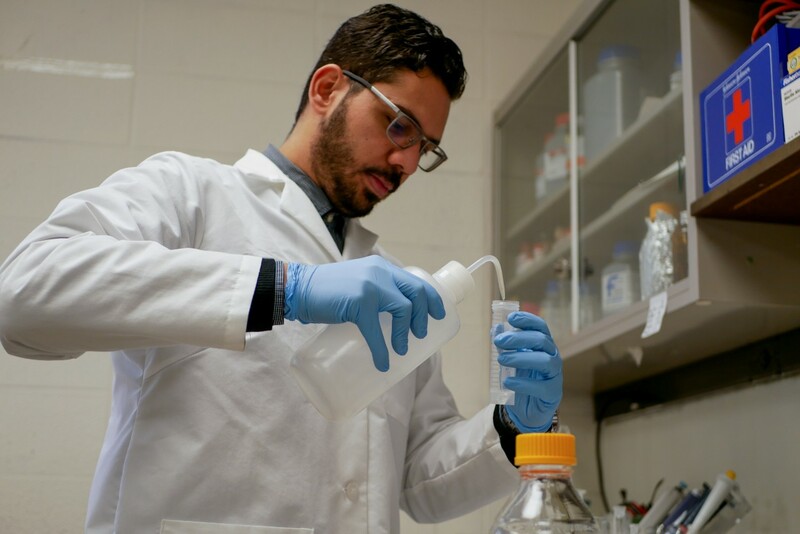 As part of his master’s thesis, environmental engineering Ph.D. candidate Assem Dewidar is using a biological air treatment process to oxidize the harmful chemicals. Unlike traditional chemical or physical treatments, this biological process is both eco-friendly and economically efficient. Dewidar’s work addresses common city health threats and leads to a more sustainable future. The research reflects the urban impact platform of UC’s strategic direction, Next Lives Here. Summer can bring more than just sunshine and swimming pools. In many urban areas, smog is at its worst in the summer. Smog is a type of air pollution formed when volatile organic compounds and other combustion emissions interact with sunlight. This toxic mix is highly carcinogenic and can affect both human and environmental health. Dewidar is addressing the harmful chemicals released by automotive shops that do car-coating and painting. When painters spray the finishing coat on a car, the nozzles they use release gaseous compounds. The EPA puts strict regulations on these emissions, but industry methods needed to meet these regulations require a lot of energy. Dewidar is proposing a biological solution, different from these conventional physical and chemical combustion processes. And it’s rooted in the same technology we use to treat our wastewater. 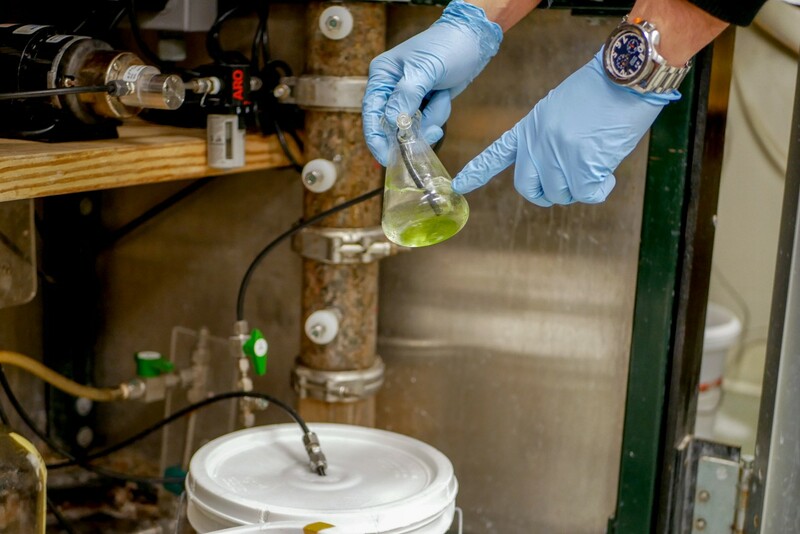 Biofiltration is a technology that dates back to the 1960s in wastewater treatment plants. Today, these plants still use biofiltration to control odors and, more importantly, eliminate contaminants from water. Microbes, or microorganisms that feed on organic materials, are at the center of the biofiltration process. In wastewater treatment, microbes live in big water tanks, converting harmful pollutants in wastewater into energy. It’s a symbiotic relationship: The microbes happily feast on the harmful organic matter, and people get treated wastewater they can safely release back into the environment. Now, Dewidar wants to entice these hungry microbes with organic compounds from paint booth emissions. But there are obvious challenges, the first being the very composition of the chemicals. Paint booths release the compounds in their gaseous state. In this form, some of them are insoluble, a problem for microbes that exist in a biofilm that is mostly water. To increase the solubility of the chemicals, Dewidar is introducing a substance called biosurfactant. Biosurfactants, which are derived from microorganisms, mobilize insoluble contaminants by increasing their solubility. Biosurfactants have properties that break down the force between atoms at the water’s surface, which reduces the surface tension between water molecules. Reduced surface tension makes it easier for the gaseous compounds to penetrate the water’s surface, where patiently waiting microbes will then consume it. And since biosurfactants stem from an aerobic bacterium, they are naturally produced and less toxic than chemical alternatives. But microbes are tricky. When microbes grow and reproduce, they start sticking to each other, as well as other surfaces. Over time, this large mass of cells forms a thin, slimy film called a biofilm (a common example of a biofilm is dental plaque). As more microbes stick to each other to form colonies, they enlarge this biofilm. 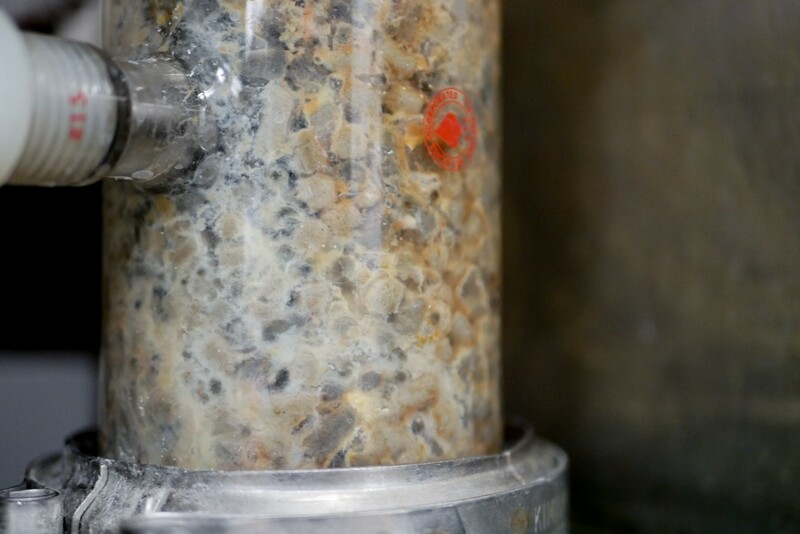 The biofilm can grow so much that it affects the air flow and even clogs the biofiltration system. If that happens, the VOCs may sneak by the microbes, escaping the system still armed and dangerous. We figured out that the biosurfactant that we’re examining not only enhances the bioavailability of the gas but also controls the biofilm. It has a double effect. Dewidar found that biosurfactants can once again be effective. Rooted in their detergent properties, biosurfactants act as anti-biofilm agents, reducing microbes’ ability to cling to each other. This double effect bodes wells for using biosurfactants in biofiltration as a long-term solution for emissions control. 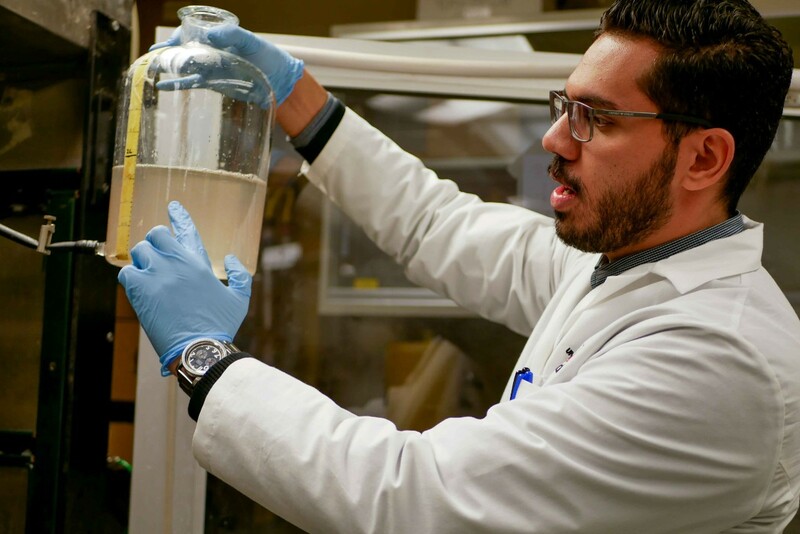 For the last year, Dewidar has been exploring the possibilities of biosurfactants in the biofiltration treatment of toxic emissions. The results appear promising. In June, Dewidar will present his work at the annual Air & Waste Management Association conference in Quebec City. 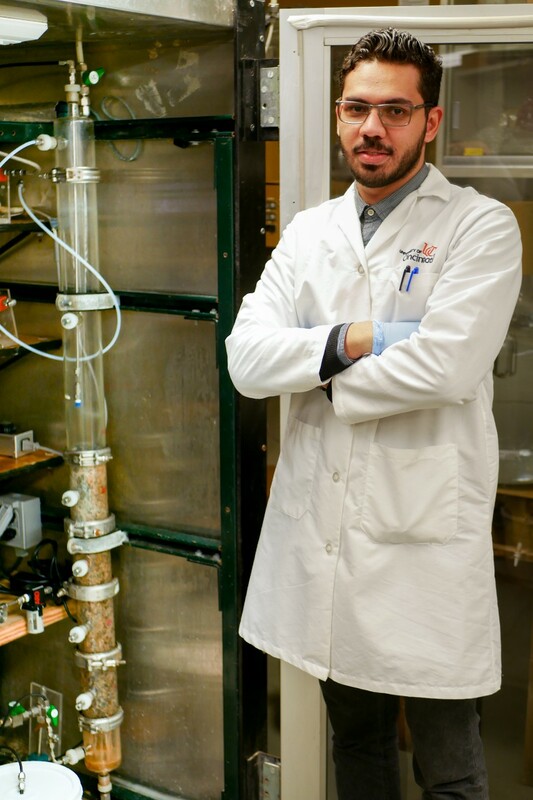 He hopes to publish a paper on the research with his mentor, UC professor and head of the Department of Chemical and Environmental Engineering George Sorial, Ph.D., and eventually scale up his work to industry. If Dewidar can make the leap from benchmark research to commercial application, it will be a step forward in creating a healthier and more sustainable world. Dewidar’s work can solve urban-based health issues and lead to a more sustainable future. Learn more about urban impact and UC’s strategic direction, Next Lives Here.